Local history librarian, Antony Ramm, takes a look at a Central Library treasure: manuscript notebooks that provide an insight into the early history of Methodism in Leeds. Our Central Library recently played host to an exhibition of manuscripts by the unjustly-forgotten Schoolmaster and Antiquarian, Thomas Wilson. 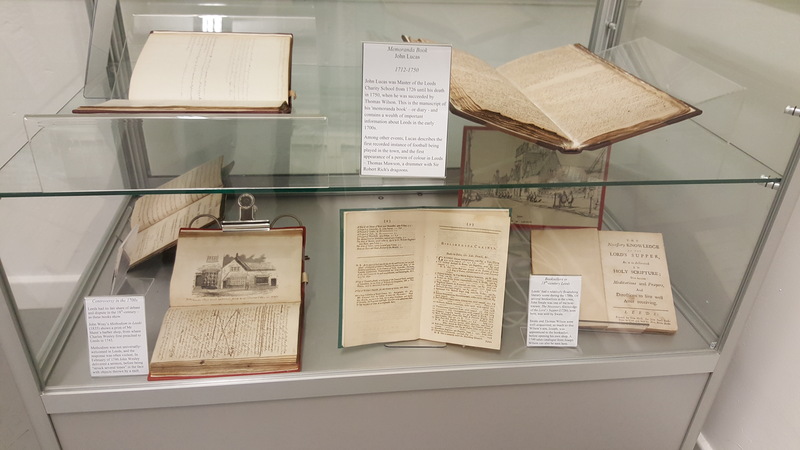 As part of that display, our Librarians hoped to contextualise Wilson’s life and work in its time and space: Leeds in the early-to-mid 18th-century. Alongside such collection treasures as the manuscript of John Lucas’ Memoranda Book and Wilson’s additions to Thoresby’s Ducatus Leodiensis could be seen the first part of a unique resource for Leeds historians: John Wray’s eleven-volume Methodism in Leeds (written c.1835-1846). 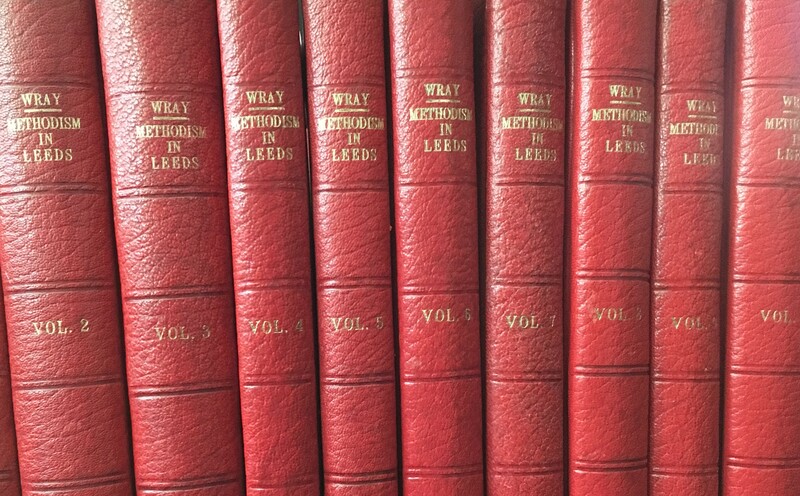 All eleven are manuscript volumes in Wray’s own handwriting and separated into several chronological periods (making this a history of Methodism in Leeds, not only an analysis of its form). 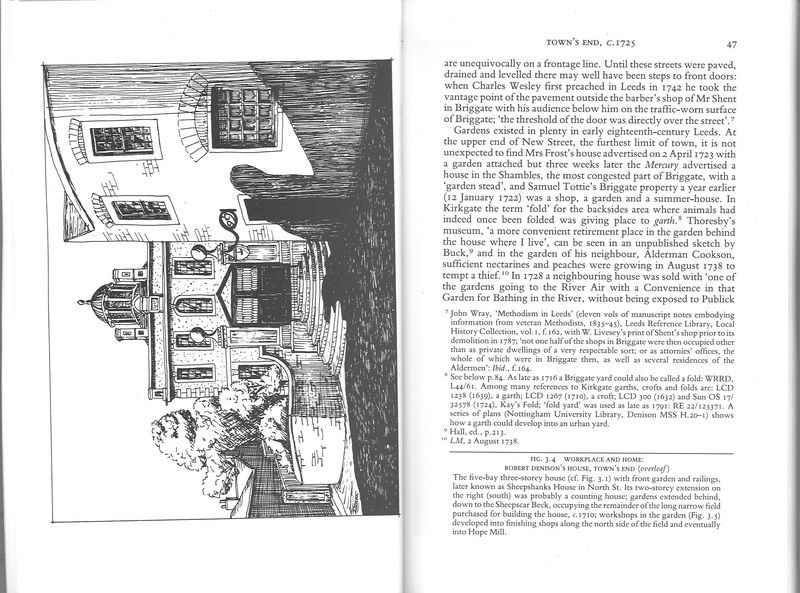 Beginning in 1735 and ending around 1816, Wray’s work is comprehensive, dense and utterly priceless – not least in part because he appears to have compiled his account from evidence given to him by veteran Methodists, whose memories reached back to the days of John Nelson: a Birstall stonemason, who first brought Methodism to Yorkshire and whose preaching at Armley in 1742 caused the conversion of one Mary Shent, the wife of William Shent, a barber of Leeds; the Shent’s conversion being the true arrival of Methodism in the town itself (and the reason for the inclusion of the book in the Wilson exhibition). As these extracts show, Wray’s writing makes a proper reading reasonably difficult; the volumes are in need of a thorough transcribing and possibly also a proper publication (a scan of the material suggests much interpolation from other sources – including journals and memoirs – making the volumes perhaps, more accurately, Notes Towards a History of Methodism). However, in the meantime, the Central Library is also fortunate enough to hold two very useful set of notes, which together provide an index to the most interesting and historically significant passages in Methodism in Leeds. One is typewritten, with no indication of its author – but a separately-typed note does inform us that “Pencil notes” are “by F. Beckwith, Leeds Library.” F. Beckwith was Frank Beckwith, himself a noted local historian and significant figure in the development of librarianship in Leeds; being Assistant Librarian at the University of Leeds Library, where he supervised the transfer of collections to the new Brotherton Library in 1936, before becoming librarian at the Leeds Library on Commercial Street (as well as writing their definitive history). The second set of notes are possibly even more significant: Alf Mattison’s Facts Illustrative of Methodism in Leeds (part of a much larger collection), a notebook – mixing Matisson’s own notes with relevant news-cuttings. These are more discursive notes than those made in the typewritten volume, with Mattison providing sample extracts alongside his own comments. Perhaps Mattison’s major contribution in his analysis of Wray’s history is to have identified the name of the author – unknown at the time the volumes were purchased by the Leeds Library Service in 1927, but uncovered through Mattison’s close reading of the text, and some supplementary evidence outside Methodism itself. These notes and index are by-far the most accessible way into the 2,500-plus pages Wray compiled. There are a plethora of fascinating details contained within those pages, many of which remain little-known to this day. 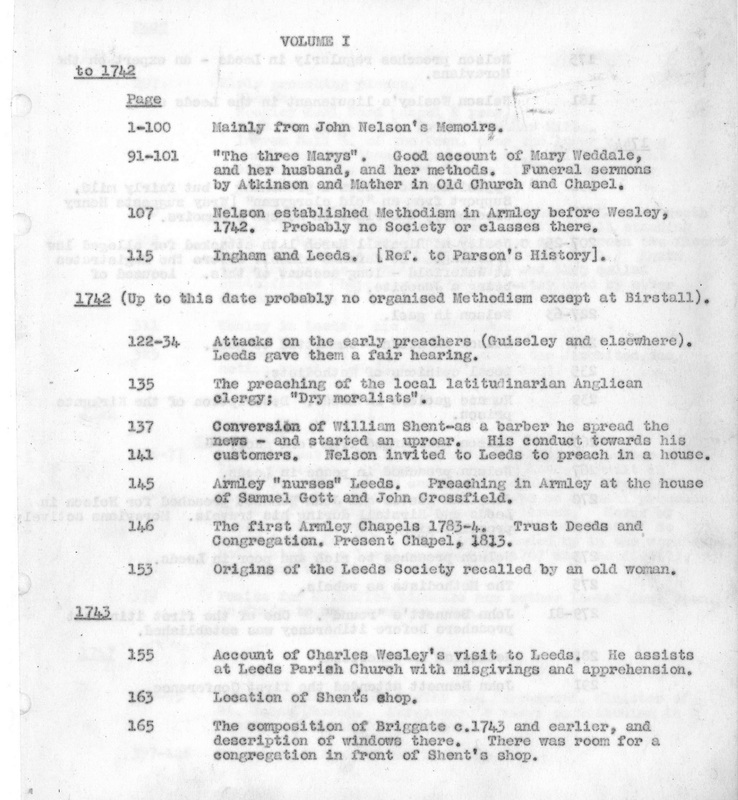 While – to our knowledge – no comprehensive analysis of the whole work has yet to be completed, aspects of Wray’s writings have certainly informed significant works of Leeds historiography. Most memorable, perhaps, is Maurice Beresford’s use of the descriptive appearance of William Shent’s barber shop, which formed part of a broader argument about the changing development of the Leeds urban landscape from the 17th to the 19th-centuries (the first Methodist preaching in Leeds took place outside Shent’s shop in 1743). Much else remains to be discovered in the Wray volumes. To start that journey, please contact the Local and Family History department on 0113 37 86982 or via localandfamilyhistory@leeds.gov.uk. At least 24-hours notice, two forms of ID and an appointment will be required to view the books.